French digital mixing console manufacturer Innovason, has just announced the appointment of Live Sound, LDA as their new distributor in Portugal. The move is the latest in a series of new distribution partnerships to be announced this year and further strengthens Innovason's international distribution network. According to Innovason's international sales manager, Philippe Pelmelle, the timing for this latest agreement is perfect. "Portuguese distribution had traditionally been handled by our Spanish distributor," he explained, "but it goes without saying that a market is almost always better served by a local rather than a remote partner. As we have recently appointed a new distributor in Spain, it was the ideal opportunity to separate the two markets and establish a Portuguese distributor based in and dedicated to serving that territory exclusively. Having been put in touch with Live Sound by a mutual contact, I was impressed by the professionalism of the operation and their knowledge of the live sound market in Portugal. 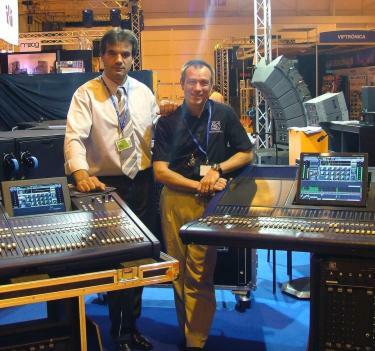 This was further confirmed by my experience of working with Live Sound at the recent Musicalia 2007 tradeshow in Lisbon where we had two consoles on the stand. Not only were the consoles extremely well received by the tradeshow visitors, but Live Sound clearly demonstrated that they know their market and are a well-respected company in Portugal. I look forward to doing good business together." Live Sound, LDAs José-Luis Matos agrees. "I'm very pleased to be representing Innovason in Portugal and I think the brand will do very well here," he commented. "The product offers everything required by sound engineers in terms of functionality, and to my mind, it offers the simplest, most intuitive and therefore easiest to use control interface of any digital console available. It also happens to be one of the most cost-effective, as well as the best sounding digital desk on the market. I'm certain that we will enjoy a fruitful collaboration!"